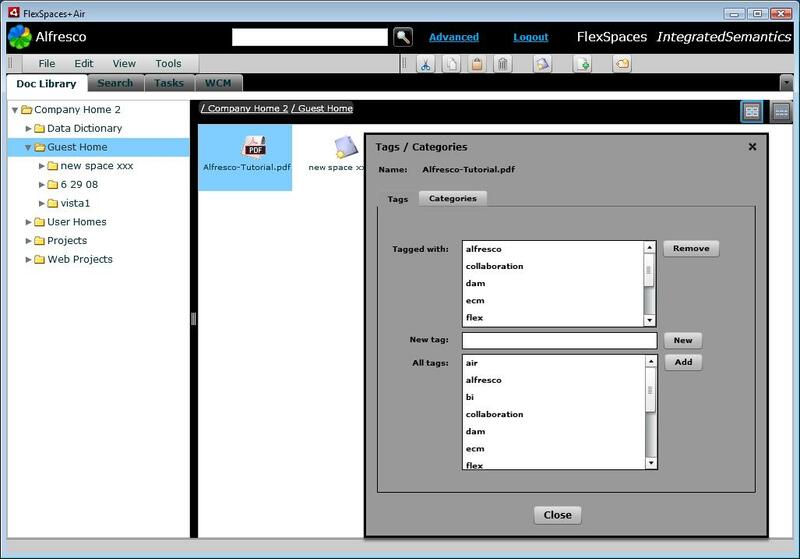 I thought I would show some screenshots of the support for tagging and categorization that will be in the next release of FlexSpaces (0.5). 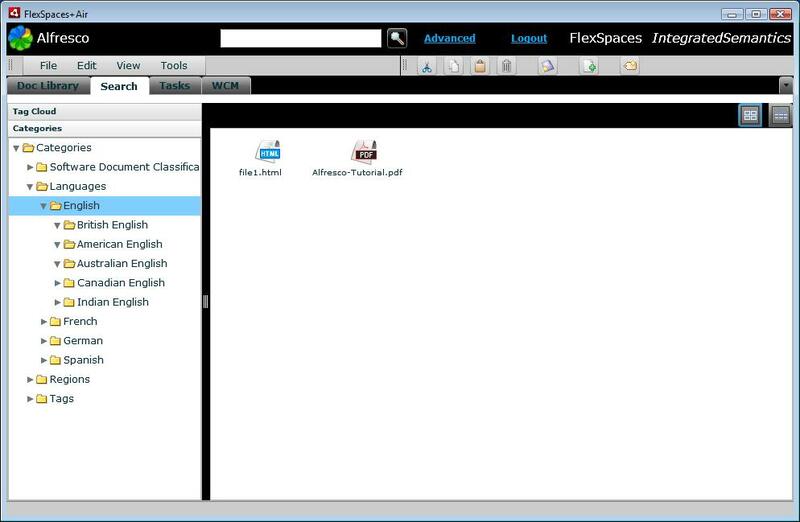 FlexSpaces 0.5 will also have progress bars added in upload, some other features, and some bug fixes. Within the search tab view, clicking on a tag in the tag cloud lists documents/folders with the tag in the search results. Clicking on a node in the category tree will list items with the category in the search results. 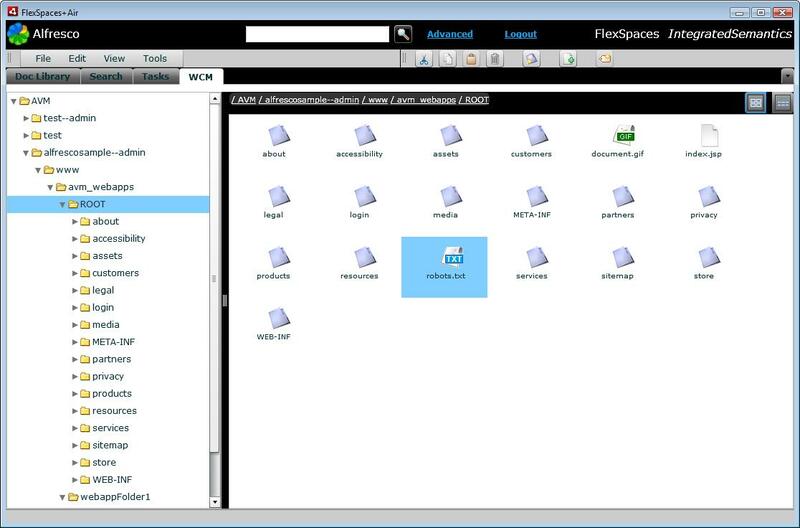 Within all the views except wcm, the “Tags/Categories” dialog can be used to view and edit the tags and categories assigned to a document/folder. 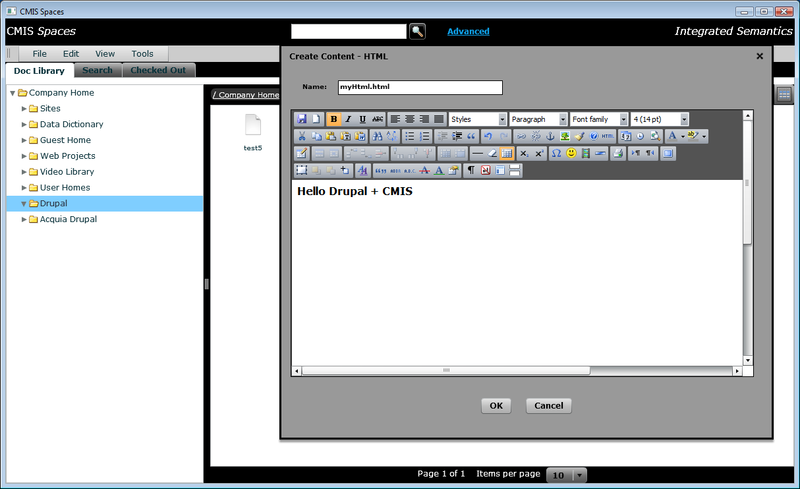 I also included a screenshot of the WCM tab added in 0.3. 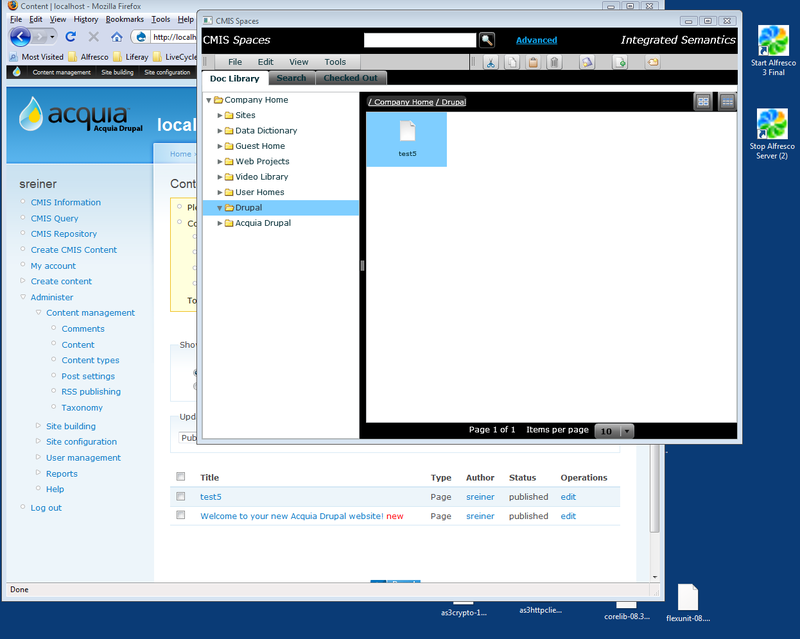 This allows you to navigate / work with files and folders in AVM stores, has a tree, and supports drag/drop between dual folder views (dual wcm panes is turned off in screenshot). 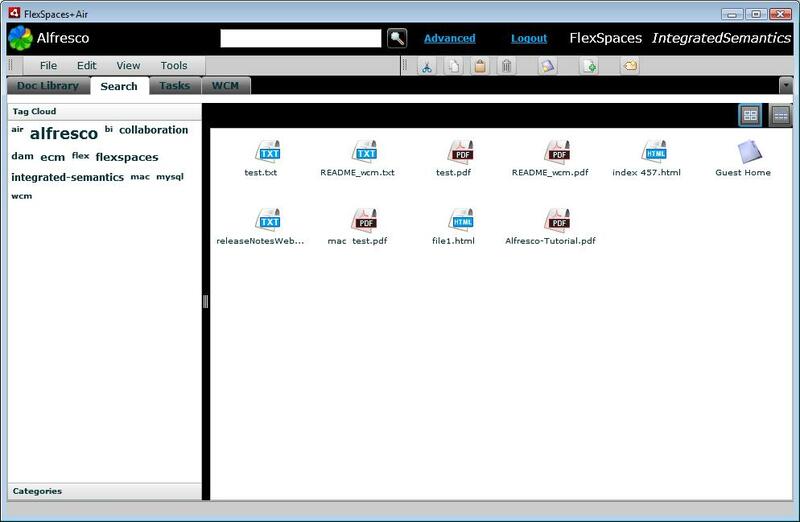 Also native drag/drop/copy/paste of desktop files into AVM stores is supported FlexSpaces+AIR. Note: the screenshots below also show the change in 0.4 to have an icon/grid view in search results with context menu support like the other views (instead of having the search results link view from the ace sample). Also shown is the dockable menubar and toolbar added in 0.4.
navigate / work with files and folders in AVM stores in new WCM tab view with tree and drag/drop/clipboard between dual folder views. 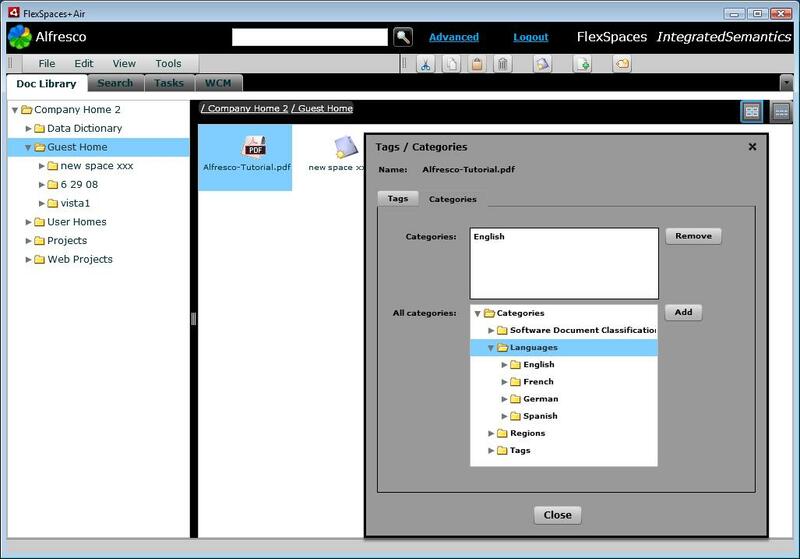 (Also native drag/drop/copy/paste of desktop files into AVM stores in FlexSpceaces+AIR). 2. Added AVM support in webscripts.